In today’s ad-saturated world, it can be hard to stand out. According to recent studies, the average American sees 4,000 to 10,000 ads every day. We ignore most of them — when you’re exposed to thousands of brands and ads every day, you learn to filter out visual clutter. As a business, you need your signage and marketing to grab attention and make a statement. However, in a world flooded by signs and advertisements, standing out is difficult. Dimensional signage offers a solution. Eye-catching and attention-grabbing, this solution is different enough to be noticed. It draws a viewer’s attention, and it remains in their minds for much longer than conventional signage. 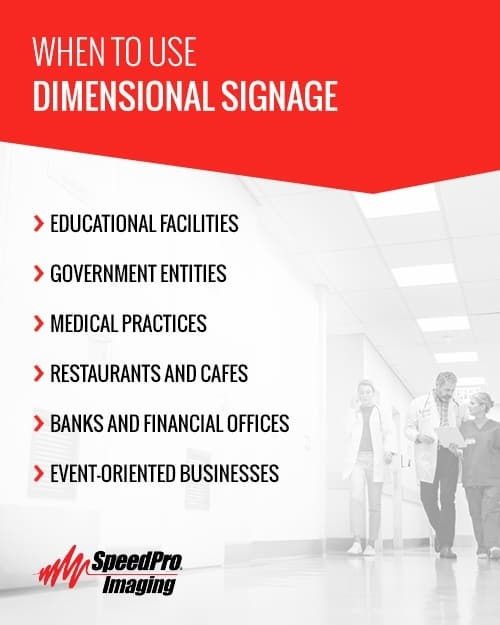 We’ve compiled this guide to examine what makes dimensional signage so memorable, along with some ideas to help you implement dimensional signage in your marketing strategy. Dimensional signage, also called three-dimensional signage, adds a third dimension to your advertising. It can take the form of both indoor and outdoor signs that have some dimensional element, such as raised lettering or logos. Wood: Wood has a classic and natural appearance that adds instant elegance to any sign or brand. Professional studios can cut many different types of wood to your specifications, and it’s durable enough to withstand outdoor use. PVC plastics: PVC is another popular material for adding dimension to signage. Tough, durable and cost-efficient, this plastic is a practical choice for any dimensional sign. Outdoors, plastic signs are strong enough to resist the wear-and-tear of the elements. Foamcore: If your brand is searching for a signage material that’s temporary, light and affordable, foamcore is one of the best options available. Although it’s best used in indoor or temporary signage, you can extend its lifespan with different coats and finishes. Metal: Malleable metals such as steel, copper, bronze and aluminum are commonly added to dimensional signs. Metallic elements tend to bring an urban, industrial and sophisticated tone to a brand — if you want your company to have a modern look, you can’t go wrong with a metal dimensional sign. Acrylic: A highly versatile material, acrylic creates a bold sign that makes a lasting impression. Because it’s so flexible, this material can be designed in a wide range of colors, shapes and sizes. Whether you use it to add a dimensional element or a decorative touch to your sign, you’ll find that acrylic is the perfect material for a unique branded appearance. The exact materials used on a dimensional sign should vary based on location, duration and design. For example, if you want to hang a three-dimensional sign on a weak wall, you’ll have to choose lightweight materials. Make sure you consider how long you want your sign to last — if you’re thinking of temporary signage, stay away from heavy, durable materials like metals and wood. Typically, dimensional signage shouldn’t be thicker than three or four layers of material, but it depends on the material used and where the sign is going to be installed. Versatile: You can use almost any type of material to construct a dimensional sign, but the flexibility of dimensional signage goes beyond materials — you can install three-dimensional signs on almost any wall surface in your building. This quality allows dimensional signs to fulfill many different functions, such as showcasing a display, highlighting your logo or directing guests around your building. Elegant: The added characteristics of three-dimensional signs make them look more elegant and sophisticated than typical signage — when a customer sees a dimensional sign, they’ll assume your company cares about presentation and is willing to invest in high-quality and on-trend designs. Unique: Dimensional signs are different. While two-dimensional signage is everywhere, three-dimensional signs grab the attention of viewers. Because they’re less common than traditional signs, dimensional signage gives your brand a unique tone that helps it stand out to customers. Engaging: Three-dimensional signage tends to generate more reader engagement than other types of marketing. Because raised lettering and designs catch a customer’s eye, people will spend more time viewing and studying your advertising than they would a two-dimensional display. Memorable: Perhaps the greatest strength of dimensional signage is its memorability. But to understand why these types of signs stick in our memory, we need to examine the difference between two and three-dimensional objects and our brains. Our brains react more intensely to three-dimensional images than two-dimensional ones. According to recent studies, people responded with more emotion to 3D facial expressions than their 2D counterparts. The brain perceives three-dimensional images as more real than flat, two-dimensional ones — as a result, 3D images invoke a stronger emotional response and mental engagement. When 3D elements are translated to advertising, the effects are similar. Three-dimensional advertisements require more sustained attention from viewers — the image seems to stretch beyond the sign, billboard or printed advertisements, demanding more engagement from customers. It’s possible to create the illusion of 3D images on flat surfaces. For example, you might not want to design new brand signage. Instead, you could be looking for a creative billboard campaign. Work with angles to create an image that appears to jump out at drivers passing by — with a 3D advertisement, people will definitely give your brand a second look. With the right angles, you can make any design on a flat surface look three-dimensional, including business cards and brochures. When they’re combined with visual advertising, the effects of 3D signage are even more powerful. The average person processes images 60,000 times faster than text — and while we process images faster than other forms of media, we’re also much more likely to engage with visuals than plain text. Researchers have even found that tweets with images are retweeted 150 percent more than those without visual elements, showing that we’re as attracted to images online as we are in real life. We’re naturally drawn to both images and 3D presentations — put them together, and they create deeply memorable results. Educational facilities: Whether you’re looking for an attractive identification sign or one that draws attention to an awards display, three-dimensional signs are an elegant and dramatic option. Government entities: Dimensional signs often have an ultra-professional and sophisticated appearance, making them the perfect choice for government offices. Medical practices: To give your medical practice a chic look, incorporate three-dimensional signs in the waiting room or reception area — they’ll create a high-quality feel for your whole office. Restaurants and cafes: Show off your eatery’s flair with a unique three-dimensional sign, and try using strategic lighting to emphasize and draw attention to the 3D elements of your signage. Banks and financial offices: Three-dimensional signage is a great option for banks and financial offices. When you use a three-dimensional sign, you’re telling customers that you’re willing to invest in high-quality branding and marketing, creating a polished and impressive business environment. Event-oriented businesses: Dimensional signage is a beautiful choice for event-oriented businesses like florists, wedding planners and event planners. Clients often approach these companies looking for an elegant tone — by investing in 3D signage, you’ll project a high-end image that will attract potential customers. Foyers, front desks and reception areas: Try hanging a dimensional sign near the entrance of your building. For example, a sign with your logo or brand in raised letters could sit behind the front desk. Dramatic and eye-catching, a dimensional sign can set a high-quality tone for your business. Hallways: Use dimensional signage in your hallways to help direct your staff and guests through your building. For an extra element, add LED backlighting to take your signage to the next level. External areas: Consider installing dimensional signage in outdoor areas of your business, such as driveways and carparks. In these contexts, dimensional signage is easy to read and noticeable, helping your customers navigate your property. You can also use 3D signage in large-scale advertising campaigns. For example, consider these surprising three-dimensional billboards. For one of them, a sunscreen advertisement took advantage of shadows by using hundreds of small white pegs — when the sun was out, the pegs cast shadows that formed an image of a woman sunbathing. Simple text at the bottom read, “Makes sense when the sun’s out.” Eye-grabbing, innovative and memorable, this billboard wasn’t one a passerby would soon forget. One of the most creative uses of 3D advertising is through guerrilla marketing. 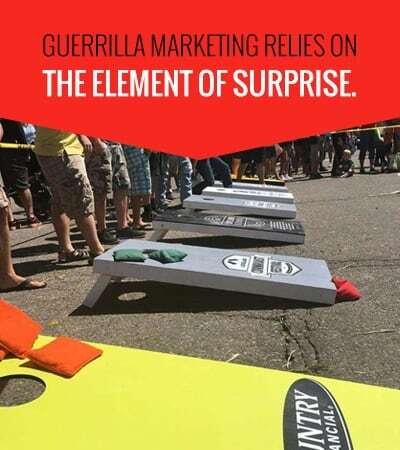 Guerrilla marketing relies on the element of surprise — it sets out to create unconventional advertising campaigns that catch people off guard. The term “guerrilla marketing” was first coined in the 1980s by business writer Jay Conrad Levinson, but over the decades, this innovative form of advertising has gone through many changes. Indoor: Indoor guerrilla marketing adds a dimensional advertisement to a preexisting setting, such as a university campus, subway station, public building or shopping mall. Outdoor: Similar to indoor guerrilla marketing, outdoor guerrilla tactics add something to outdoor environments — for example, one outdoor guerrilla campaign could involve temporary art installations on a busy sidewalk. Event ambush: In this type of guerrilla marketing, advertisers take advantage of a well-attended event to market their brand to the audience. Common types of events targeted by marketers include sporting games and celebrity concerts. Experiential: Experiential guerrilla marketing can be indoor, outdoor or at an event, but it requires the public to interact with the advertisement in some way. Cost-effectiveness: Depending on its scope, duration and materials, guerrilla content can be relatively cost-effective. Although it requires a greater intellectual and creative investment, implementing guerrilla ads is often inexpensive. Because it typically involves repurposing parts of an existing environment, this form of marketing is often more affordable than creating new signage from scratch. Surprise: Guerrilla content is designed to make viewers stop and do a double-take. The ultimate in memorable advertising, guerrilla marketing campaigns tend to cause viewers to stop and interact with the ad. In today’s connected world, many viewers will even record and share guerrilla content online and through social media, extending the exposure of your brand. Bounty’s popsicle: Bounty paper towels are known for their quality. In 2009, the company took its advertising to the streets of New York. Bounty created two larger-than-life “spills” across the city: a giant melting popsicle and a massive tipped-over coffee. Next to each installation, Bounty had a simple outdoor sign that read, “Bounty —Makes small work of BIG spills.” Passers-by stopped and took pictures with the installations all day, spreading the campaign online. Advil’s headache: A headache can feel like a stabbing pain in the head. Advil took the metaphor and made it literal — in an innovative banner ad campaign, the company used lamp posts to illustrate their point. The company hung the advertisements so that the posts came through the center of a man’s forehead, and the tagline read, “More Powerful than Pain.” Effective and memorable, this campaign used lamp posts to add a cost-effective and impactful dimension to the banner. Dimensional signage is the perfect way to bring life and energy to your brand. Fresh, versatile and memorable, three-dimensional signs are the perfect way to showcase your brand and create a memorable impression with your customers. When you begin planning your new signage, don’t settle for less than the best. With industry-leading materials, state-of-the-art technology and a nationwide network of professional studios, SpeedPro Imaging is prepared to help you take your marketing to the next level. When you begin a project with SpeedPro Imaging, the first step is a detailed consultation session where you can share your vision. Our signage designs are versatile and customizable, allowing you to choose a look that connects with viewers and emphasizes your brand. Find a local studio and begin updating your signage today.